As the gaming industry continues to become more and more prominent in society, it also becomes the focus of more media attention. With the media being, well, the media, lots of negativity gets thrown in the direction of gaming. Parent clubs, social clubs and religious groups often criticize gaming for numerous reasons. Like any other medium – music, books, film – gaming has its disadvantages, but also its benefits. Both the pros and cons should be fairly assessed, and balanced out, because video games have significant benefits. Allow me to first address some of the common criticisms of gaming. Violence and aggression would easily be the most common. Like movies have, games have become more violent over time. There is more ‘blood and guts’, there is more killing and there is more aggression. Far too often people worry that this means gamers will take what they see in the games and become more violent themselves. To deny that this happens would be untruthful, but in most cases, the reality is the exact opposite. Games allow the players to vent themselves, if you will, or release their tension and stress. It is a way of venting aggression, which prevents people from taking it out on others in violent ways. Solitude and addiction is another criticism of gaming, in that it can occupy way too much of people’s time so that they suffer elsewhere, such as school, work or in relationships. It is a valid criticism, because it does happen – but this criticism can be applied to anything. Television, books, sports, walking in the park – anything. The susceptibility of gamers to become addicted, or dependent, doesn’t make gaming itself a ‘bad’ thing. Addiction is a risk all about in life. If we don’t do something just because it could cause addiction, then we’re in for a life with lots of missed opportunities for fun (don’t do drugs by the way). If someone does become addicted, then yes, a lack of going out and getting sociable does exist. They may lack social skills, and prefer to be alone with their games. Again, this is a potential negative, but gaming has just as many, if not more, potential social benefits for gamers. Nowadays, gaming is especially about playing together with others – online and in person. Gaming has bought families closer together more than it has torn them apart. Gaming gives players a sense of accomplishment, an enhanced self confidence that can further enhance sociability. Due to its prevalence in modern society, gaming proves itself to be a very common topic amongst new people that often sparks relationships. 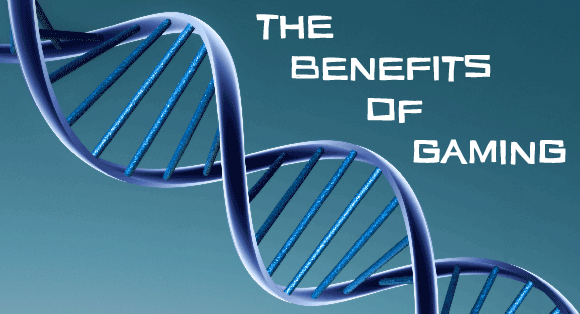 Gaming is also associated with physical benefits. In younger children, gaming assists in motor and muscle development, and it strengthens other motor skills in developed people. Reflex times and hand-eye coordination are known to be much better nowadays than they were for our parents and ancestors. This is largely due to gaming, and how it requires quick actions in response to stimulus on the screen. Some suggest that gaming even makes people better drivers because of their enhanced ability to respond to hazards and changed conditions. Additionally to physical, there are mental benefits associated with gaming. They can enhance mental capacity and cognitive processes through the amount of problem solving in them. ‘Problem solving’ is one of the most mentioned employability traits and its right there at the heart of gaming. Players must find solutions using initiative and what limited resources they have. Of course, not all of these problems are overcome immediately, which builds up persistence and perseverance as a personality trait. Gamers also often gain management skills as they deal with their parties in an RPG, or have to allocate resources to achieve the desired outcome. So many games also have some sort of currency system that enhances money skills and numeracy. People also learn language and history from games that are based in the past or in a foreign country, as well as culture. Gaming also can enhance concentration times, or attention spans, due to the mental focus they require. On another level, gaming provides moral messages that are woven throughout their stories. People are often inspired by these motives and take away significant lessons to apply to their lives. Gaming is also associated with higher levels of comprehension. Intricate plots and twists require deep thought processes to fathom, and in a number of games a lot is left open to the players, allowing for theorizing and mental fact organization, further strengthening mental capacity. There are yet more benefits for me to mention. Gaming is another medium that allows a release, or escape, from life’s circumstances. It is that bit of fantasy and relaxation that is a pleasant hobby, increasing enjoyment and satisfaction in life. As much of an escape they can be, when players return they do so with other increased abilities and skills. Modern gaming can even provide workouts and exercise, helping to increase fitness. So then, would you prefer to be sitting around watching television, or engaging in a bit of gaming? Which one is more beneficial hey? As I’ve said, it has its pros and cons. To call gaming only negative or only positive is ignorant. Instead, see it for what it is. A hobby that is full of benefits, but also contains risks – like everything in life. Before people take stances on the nature of gaming, often based on misconceptions, they should do a cost-benefit analysis of their own. In the end, anybody can see that gaming has significant positive aspects. It has been a benefit in my life, and it can be for anyone else too, if they let it.